High user satisfaction rates. 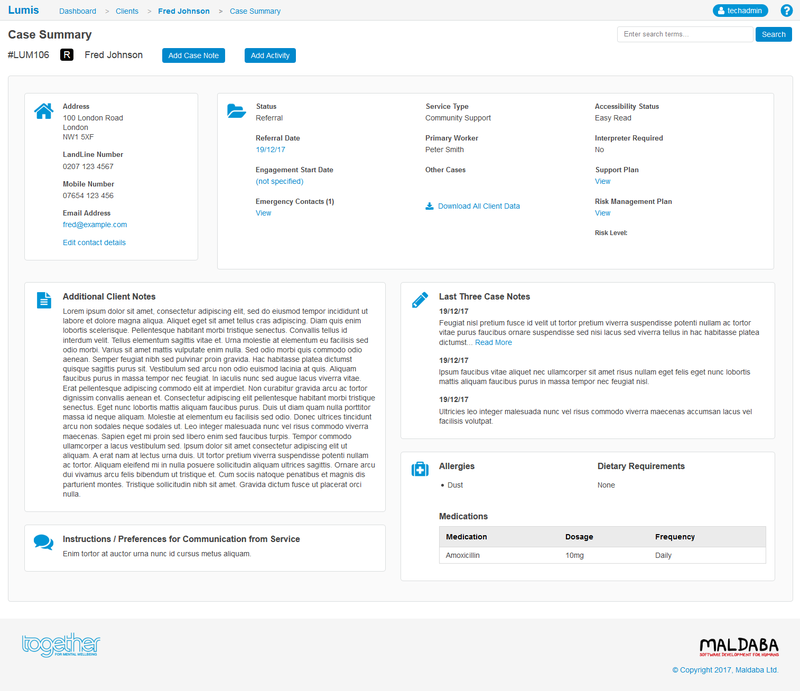 A system that helps front-line staff in daily work, supports service managers with internal and external reporting, and provides business intelligence to head office. Together for Mental Wellbeing (Together) is a forward-thinking national charity who work alongside people on their journey to improved mental wellbeing, supporting them to live independent lives. Maldaba met Together in 2014, and the organisation’s senior managers had already translated their mission into business goals: consolidate the charity’s position as a provider of high quality residential, outreach and criminal justice services. Key to Together’s success was growth, and in order to scale-up their operations the management team needed better digital systems for their staff. They wanted better intelligence about the people they work with, the outcomes of their support, and an organisation-wide view of their performance. Maldaba led a discovery workshop, helping Together to articulate their needs. 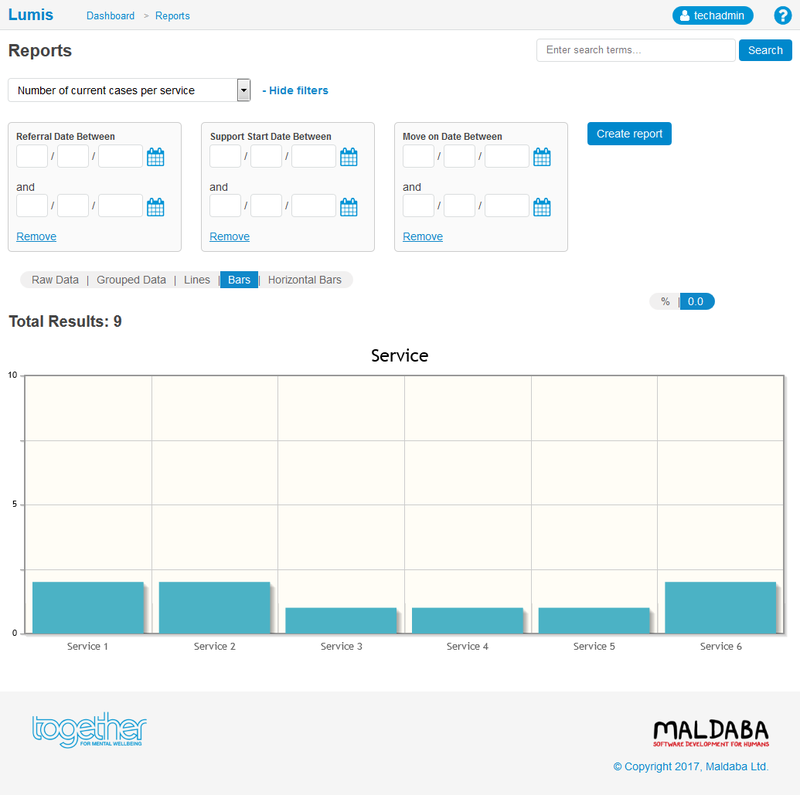 Together then commissioned Maldaba to conduct a requirements analysis. Maldaba visited Together’s offices across the UK, understanding the different service types and meeting the staff delivering those services. Maldaba spoke with senior management, performance and quality, regional managers, service managers, service staff and head office staff. 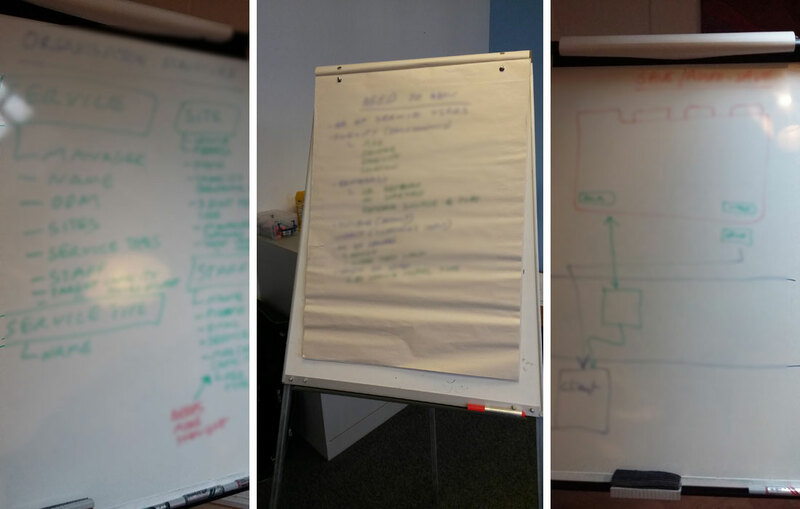 We spent time with data, finance and IT staff to understand the organisation’s infrastructure and processes. Our detailed analysis enabled Together to review their options. At the end of 2016 Maldaba and Together began a bespoke development project to create Lumis, the charity’s case management system. On Maldaba’s advice, Together assembled a user group representing a cross-section of the organisation. Through regular workshops, Maldaba delivered a system that supports and benefits all staff on a daily basis. The system went live in autumn 2017. Staff log in to Lumis on a daily basis, the dashboard gives them a headline overview. Data is linked, and easily filterable, which enables staff to quickly target specific information. Service staff are able to manage their caseloads and can track their current activities with service users. Managers can see how their service is performing. Because the system is web-based, performance and quality teams as well as senior management have instant access to real-time information entered by staff, and staff are motivated to enter this information because it benefits themselves too. Lumis integrates with Together’s identity management to minimise user administration of the system. Lumis uses Maldaba’s powerful reporting module which offers graphical and tabular reporting. 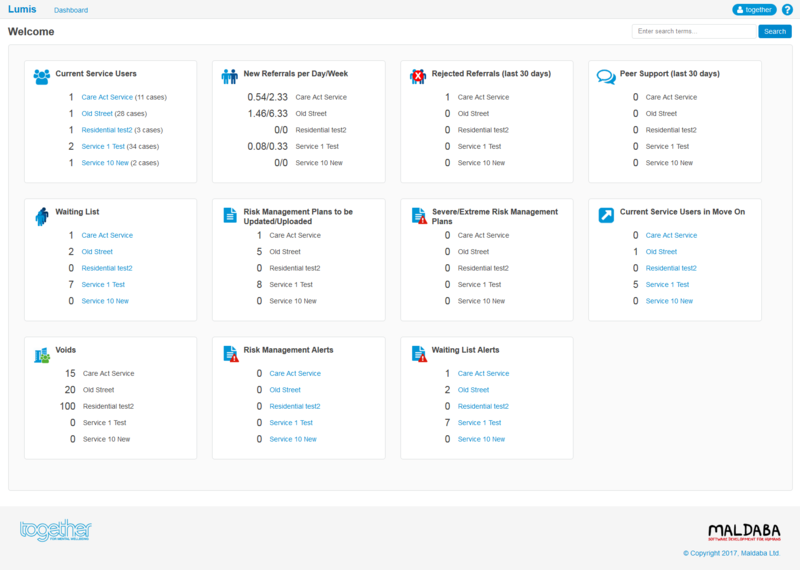 Users create report presets to quickly run the same report again and again. Staff who work with intermittent internet connections benefit from the system’s auto-save feature which performs frequent background saves while the user is online. Before the connection is lost the information is stored as users work, and users pick up where they left off once connectivity is restored.